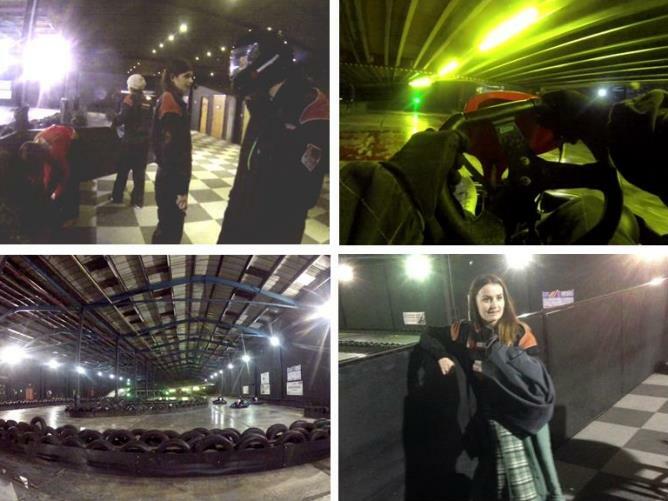 If you are looking for the perfect thrilling activity, without taking the gamble that you will get a soaking from the rain, then this fantastic Indoor Go Kart Racing experience is for you. The junior karting activity is perfect for kids and adults, so you can finally find out who is the best driver in the family! Located at either Brighton, Crawley, Reading or Bristol, there's plenty of choice for a fun-packed adventure day out. You can either kart together as a mix of children and adults, or if you'd prefer to let the kids have their fun, adults are welcome to watch from the sidelines and cheer them on! The experience starts with a full safety briefing and introduction to the karts and rules, before you're let loose on the track for two 15-minute driving sessions. At the end of the race, you'll also receive electronically timed lap print outs, so you can be sure who the winner was! To begin your session you will first receive a safety brief about the track and the issue of your safety kit including your helmet. In your first session you’ll have 15 minutes on the track split into a practice immediately followed by qualifying. After a 15-minute break you’ll come out of the pits in race order, before lining up on the grid for the start of your 15-minute race. Trophies are awarded to the top 3 drivers. This experience is available on selected dates throughout the year - subject to availability. Please Note: This experience is not bookable on Saturdays. For this experience, sessions must include at least one junior. This experience is not advisable for those suffering from any illness that may affect driving, drivers who are pregnant, or who may have a pre-existing back complaint. The track lengths vary at each centre, so total time will depend on location. On average, you should allow 1 hour 30 minutes for the experience. Participants: The Family and Junior Indoor Go Kart Racing - Brighton, Crawley, Bristol, Reading is for 2 participants. Groups of up to 36 can be accommodated for. Please wear trousers, long sleeve tops and soft soled shoes, i.e. trainers. All participants are required to wear a balaclava under their helmet whilst racing. Customers can purchase a disposable balaclava from upon arrival for 50p, a reusable cotton balaclava for £3.50, or can bring their own. Out of all the experiences I have taken part in during my time here, only the bungee jump has involved several members of the teanm, and even then it wasn’t everyone. 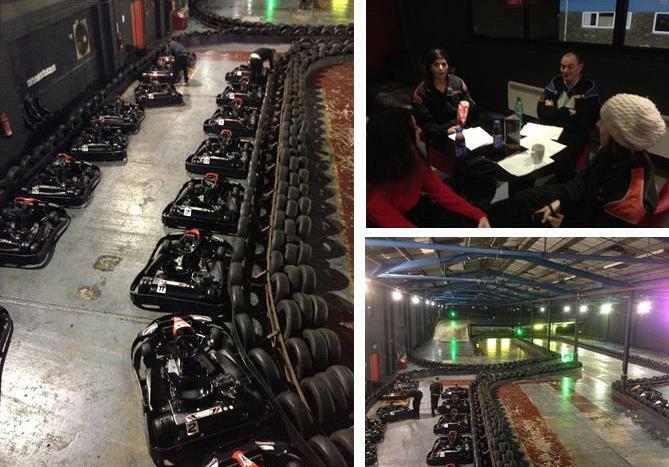 So I was very excited when we decided to go Go-Karting with Team Sport as a whole office! Arriving at the centre, we were kitted out in racing suits and shown upstairs to the briefing room. After a short video teaching us the rules of the road, it was karting time! I was in kart number 13, which could be a good thing or a bad thing, but luckily I’m not superstitious (much). Everyone else from the office had done this experience before, so I wasn’t expecting to rank very high on the leader board (good excuse, huh?). The instructors said the first lap was supposed to be a practice, but apparently that doesn’t mean anything to the men of the office, as they were off tearing up the track and overtaking me at every opportunity. The go-karts themselves go very fast, a lot faster than I was expecting, and it’s fairly easy to skid round corners and bump into the sides (for me, anyway). The track starts with a couple of hair pin bends, then up a ramp, round a corner and down a slope, round a few more hair pins before going through a tunnel, then a long straight before you’re back to the beginning. It was so much fun navigating the tight corners and building up enough speed to fly up the ramp, even if I wasn’t very good! At one point I did completely spin out and the race had to be stopped so I could be put back on track (literally), but altogether everyone did very well. Once the second race was over, we collected our racing stats and headed to McDonald’s for a nutritional post-race dinner. Altogether it was a very enjoyable evening, definitely worth the aching arms the next day! Huge thanks to Team Sport for being so accommodating and making the races run smoothly. Can’t wait to try it again!